Another reason is that the common approach appears too normal for our unsuspicious experience and we have accepted them for granted without having the desire to be inquisitive. We tend to satisfice when looking at the same thing in the same manner. In some ways we are also conditioned by the similar approaches which most of the contemporary business literatures have “indoctrinated” us. For those who have not heard about the enneagram, it would be very necessary for me to define here the ancient symbol known as the Enneagram or a nine-point diagram. This symbol is conceived based on two ancient but quite established general laws of the universe, namely, the law of three and the law of seven. The law of three states that there are three forces necessary to create a process leading to any living entity or system and therefore include also all business organizations. They are the active forces, the passive forces and the neutralizing forces. The law of seven states that there are discontinuities in the process of creating the entity causing the formation of qualitatively and functionally different but related sub-entities or discontinuities called “stopinders” and these will increase discontinuously into octaves of 7 different “stopinders”. In the animal world, we can see a male, a female and their off-springs as an example of the law of three. In the world of religion we talk about the trinity – God the Father, the Son and the Holy Spirit. In the world of light, we have witnessed the seven colors in an octave and a 7 X 7 = 49 colors in the possible seven inner octaves of the fundamental octave. The same goes for the music phenomenon with its seven notes – do, re, mi, fa, so, la, ti and do. And there are many more examples if one cares to see. The enneagram is represented by a symbol. How does the enneagram help us understand and interpret contemporary business organizations? Can we give deeper meanings to their current structural mystery? Is it possible to interpret them with these two sets of ancient laws of the enneagram? If possible, how? Further, why do we want to know it? Or rather what will we lose if we do not know about it while our competitors know it? Firstly, we will gain more if we discover more meanings in the structures of our organization. Secondly, it is possible to use an enneagram to explain the organization structure. Thirdly, to know more is always better for we have an additional tool to help solving our problems. Fourthly, we lose nothing by having a wee bit more of the knowledge. And finally, we have a definite competitive advantage in terms of the gains in knowledge and understanding, in diagnostic speed, in a shorter time for constructing a healthy “organic” organization properly that is in line with the general laws of nature and in improving it upon discovering its weaknesses. I believe that the great miracle, ‘the world of business organizations’ as part of the scheme of human natural activities preordained for his nature and independent of his weak wills though he seems able to change it in a small way, cannot escape the captive general laws that have been discovered in the other parts of the grand scheme. Any organization that is open must feed, otherwise it will close and die. Inputs can then be seen simply as the normal process of feeding and outputs are excretions but in a very special manner. And that is how the organization grows. A very important point to note is to spot the “shocks” or the decelerating/accelerating points along an octave. There are two such points one at the ti-do interval and another at the mi-fa interval. They are important as there is something missing in the vibration scale and something must be inputted or push into it or push out of it at these two points to make the entity living and growing. For business organizations, the two inputs are the intangibles for the ti-do interval and people for the mi-fa interval. These two inputs will work on the raw materials to live the enneagramic organization and create an inner demand within the organization for vertical and horizontal expansion. Both intangibles and people will flow out in the way they flow in at the two intervals – flow in to accelerate and flow out to decelerate the organization. As the flow out we know the company is going to branch into new companies, and may have to deplete itself as it gives birth and nourishes the new baby company. My observation on the pyramidal structure of many organizations has crystallized in me a necessary conviction that the enneagram applies and could be discovered in the inner configuration of all growing, developed and dying organizations. The three foods are the inputs that would undergo a very complicated processing function (or digestion) before any output is possible. All these inputs would be transformed, used and exhausted in the enneagramic system. The intangible inputs form the active force, the raw materials input forms the passive force and the people input forms the neutralizing force – an indication of the law of three that explains the basic genesis of a natural business organization. When intangibles enter the enneagram, they first enter into the strategic system. In this system, they are digested and converted into missions, strategic goals, strategic objectives and plans, implementation plans, etc. The processed intangibles are sent into the finance/accounting system for further conversion into financial plans, budgetary and cash flow plans, etc. People (production workers and others) enter the enneagram at this point through the human resource system for processing and placement in the respective work areas of the organization. The people and the intangibles so processed would enter the research and development system for further investigation and research, and finalization before been sent into the production operation system. An input known as raw materials which is mostly physical in nature acts as the passive force to be 'shocked' with the other intake octaves so that the production operation system could create the products, services or ideas into their final, complete and consumable forms. These final forms would then enter the marketing system to be further distributed in the exchanges at the market and become food for other organizations. However, owing to this exchange in the market the organization acquires an immediate 'money' input at Do 9 as the new intangibles. The inner octave will continue to move as long as the organization is alive. Intangibles that are ingested into the organization is managed in the strategic system. This provides the guideline to the human resource system that in turn needs more people input to proceed further. The intangibles and the people is reexamined in the finance & accounting system before the process is carried out by the production operation system that will operate only when materials are ingested. The production process will create the final products, services or ideas. The products, services or ideas would then be sold in the market upon emerging from the marketing system. The research and development system would reexamine the outcomes of the whole operations especially on the products, services and ideas, and develop new ones. Diagram 2 shows a centralized model of an enneagram. In such an enneagram, the systems are given equal powers as they are departments of the same level and they are all linked to an important input, the intangibles at Do 9. In this model, which is one of the nine possible variations of the enneagram, the strategic system and the marketing system are the two most important systems and they occur nearest to the Do 9 input (intangible food intake). The outer octave of the model is equivalent to the inner octave of the earlier model. The inner octave shows a link to a center of power (president) from the departments and the departments are directly linked. The proximity to Do 9, reveals an important point that although all the departments are at equal level, some are nearer to Do 9. And these are the strategic system and the marketing system, a fact whose importance cannot be denied in modern management thoughts. Concerning the intake of the food, people, the movement would place them, according to the pyramidal principle, in the respective position according to the intention of the higher forces within the business process, that is, to say they could be destined to become the boss, the managers or the workers. As to the intake of the food, raw materials, they are used to coat the pyramidal structure with the physical bulk through the engineering processes. 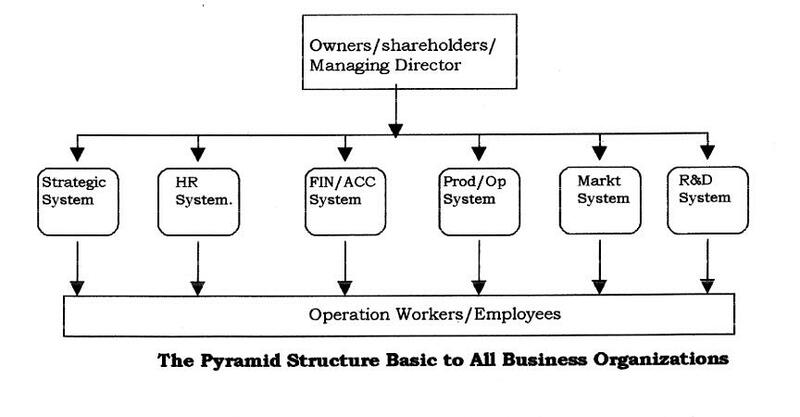 This physical coating creates the bulk of the first body of the business organization, whereas the intake of people is used to produce the organizational pyramid. As to the intake of the food, intangibles, they are used to coat the inner psychic centers of all the people forming the pyramidal structure starting from the owners to the managers and to the employees and vice versa. With the creation of powerful machines such as computers, the intangibles are also processed, coated and stored into the computer system. Here I must point out that the accounting dollar unit is part of this intangible intake octave, and a very important one. The accounting as well as the financial functions manage these value units as if they have move out of the human brains after associating each and every outside tangibles and inside intangibles of the company in various forms – prices, costs, rents, wages, salaries, good will, copyright, patent, etc. 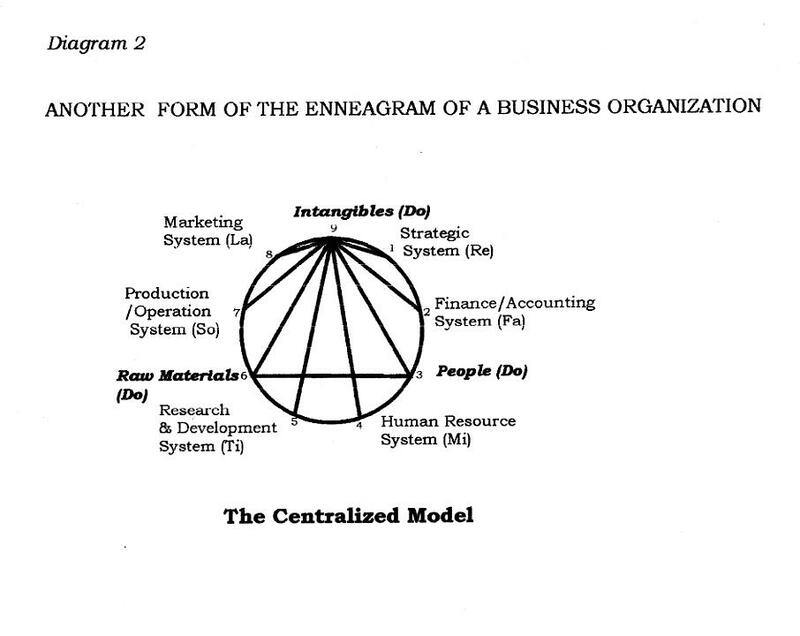 This centralized enneagram is analogous to the contemporary pyramidal model for describing the mystery of organizations. The contemporary structure is based on the static and one-dimensional approach to naïve seeing of an organization. The ennegramic seeing will be “additional” seeing and additional possibility. The inner octave of the middle component consists of strategic, human resource, finance/accounting, production/operation, marketing and research and development systems. The middle component ‘logically’ departmentalizes in accordance with the enneagramic rule for sevenfoldness. The other two components are the owners/managing directors above and the employees below. Most seemingly groups of interrelated activities and fragmented ‘beings’ are most often the broken-up parts or waste parts of the once living beings. They are likely to be the remains of a broken-up enneagram without the holy spirit. They are often the passive physical matters used for coating an enneagram not in accordance with the laws of three and seven. In a fenced up area, there is a cat, a chicken and a goat. At one corner, there is a pond. In the pond there is a fish and near it a toy, a book and an old overturned automobile. A mad man is singing a cacophonous song and in his hand is a rose. And all of them seem to be moving in some indescribable pattern within the fenced up area. Can you create on enneagrama for this “organization”. Not possible! There is no inner trialectics producing the various parts and they are not interconnected. These parts are just placed side by side as independent fragments. In such a situation, an ordinary logical non-enneagramic method should be used to examine the situation. The subject could then be linked to the parent enneagram in the bigger picture. Mere mechanics and logic dominate the approach instead of the living approach of the enneagramic paradigm. For an organization, the input of capital investment force would enter at the top component in the organization, the input of management force would enter at the middle component and the input of operational work or labor would enter lower component. The three separate input forces are linked to the 3 organizational inputs ‑ the intangibles, the people and the raw materials. Although the managing directors, the managers and the operation workers are just people, the investment capital is attached to the directors and it is separated to become the intangibles. Then the entering of raw materials specifically is the entry for the organization’s physical body. 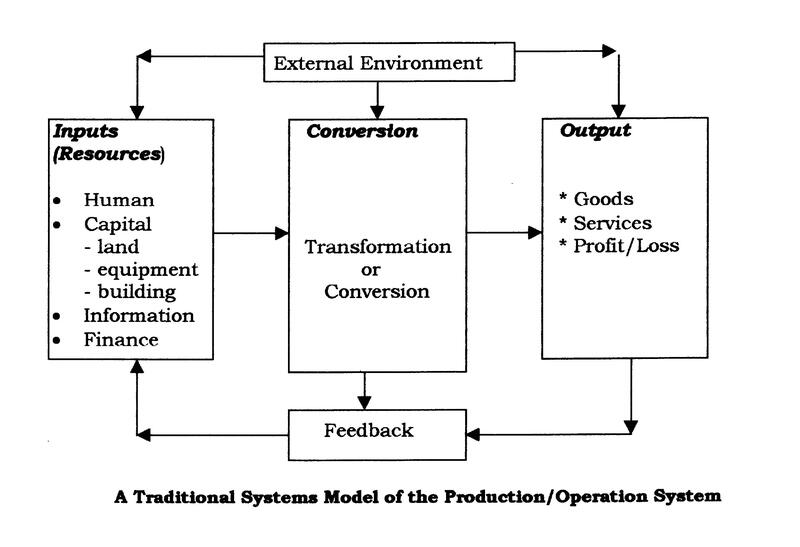 The conversion octaves within would involve the conversion of all the raw materials by proper production methods, the conversion of all the intangibles (the financial processing, accounting processing, information processing, strategies processing and research & development processing octaves) and the conversion of people by the human resource processing octave (human resource planning ‑ recruitment (do) ‑ selection (re) – orientation (mi) ‑ training & development (fa) ‑ performance appraisal (so) – transfer (la) – separation (ti). The outputs would be just the goods and services and profit or loss together with the waste matters of the organizations. Intangibles: Information, finance, communications, working capital, capital, etc. Materials : Machineries, lands, equipment, buildings, raw materials, etc. The more the body of the organization is pressured by the external environment, the more the organization will direct its flowing forces to ease the pressure from the external environment. If there are no outer or inner pressures to the organization, the flow to live the organization will still continue 'silently' from the result of the trialectic forces within itself. To reflect the real world we have to speak of all these “notes” in the inner octaves of an organizational enneagram. However, the various degree of development of each of the “substopinder” inside the enneagramic organization would create objectively and qualitatively different organizational species. 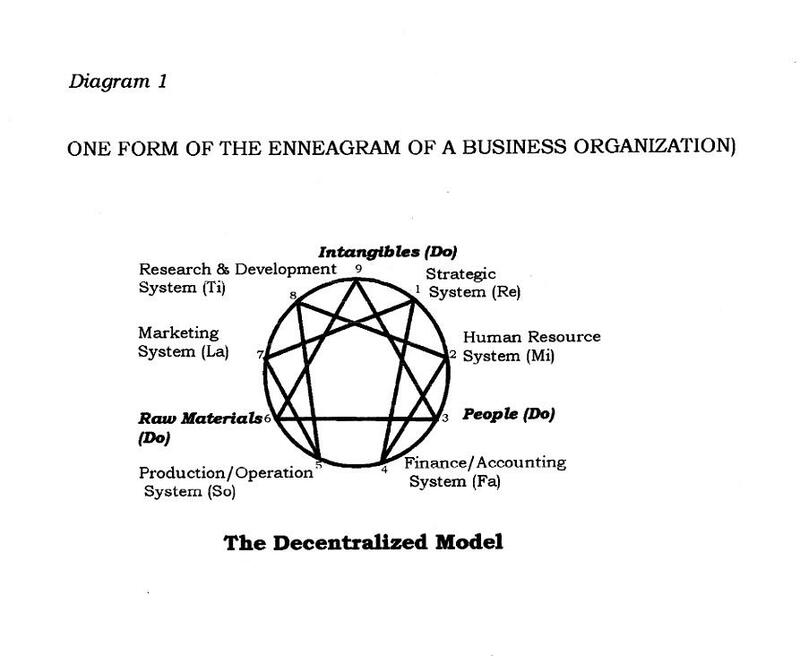 Having explain the business organization structure with the enneagram paradigm, one might still think of using this same method to integrate other societal entities. 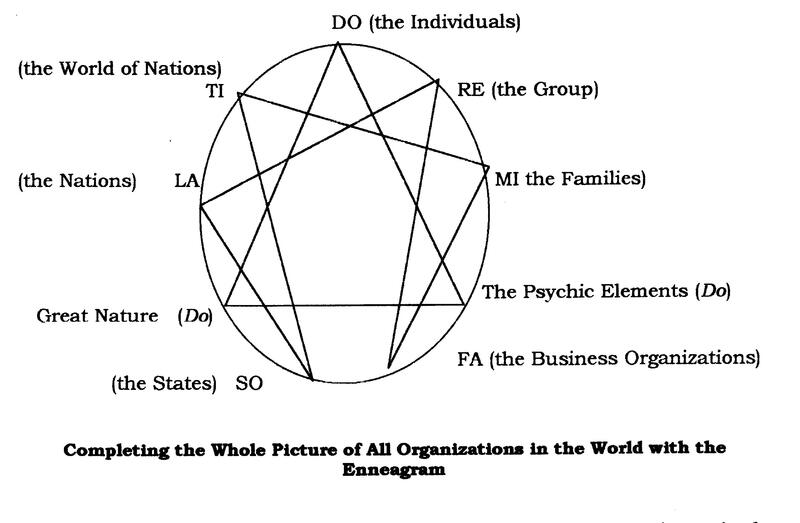 If we can also find a way to link and understand such societal entities as the individuals, the groups, the families, the organizations (especially the business organizations), the state, the nations and the World of Nations, I believe an enneagram can do it. A number of organizational entities can again be interpreted using the same enneagramic principle. It is hope that this enneagram will leave a good basic impression to the reader for further development.